Yesterday the poet Mary Oliver died. Yesterday some very small children at the French language, Catholic school, near Little India yelled through the fence at passers by “Give us all your money, or else” (in English) and giggled maniacally. Yesterday, like most days, I quietly drank coffee, it was grown in Brazil and Columbia, and had journeyed Northwards to a cup in my cold hands, an everyday miracle. Happiness connects all these things. I remembered this picture and how it encapsulated hope and happiness. 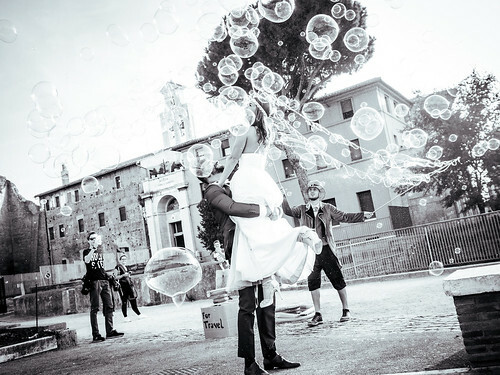 The bubbles and the travelling bubble blower, the excitedly embracing couple, the baby held in an onlooker’s arms. Wherever they are today I hope they still remember how to be this happy. I thought about the poet and her appreciation of everyday miracles. Today my coffee was from Ethiopia and Honduras, I silently toasted Mary Oliver.